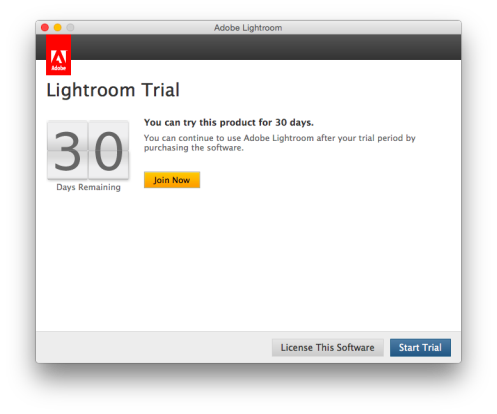 If you want to buy Lightroom with a normal, perpetual licence, don’t try going via Lightroom’s main page – it will only lead you off into the cloud. 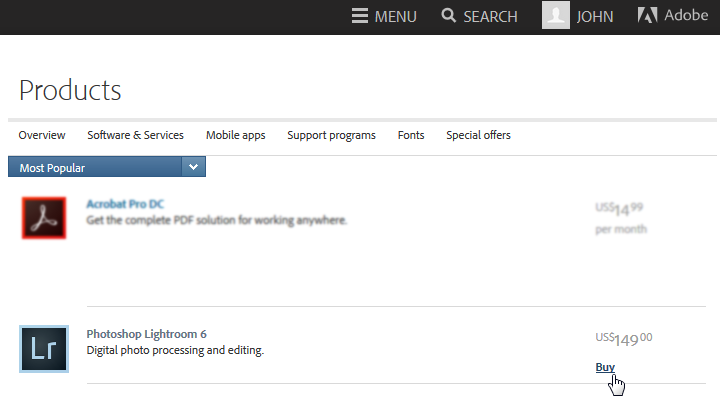 Instead, you need to go to Adobe’s Products listing page. 3. Choose the Full or Upgrade version as appropriate. I think the purchase should be obvious from there, and you should get a serial number. 4. When you install Lightroom, you will have to sign into Adobe Creative Cloud. 5. You may be lucky and notice a Licence this Software button – if so, ignore this step. But if you do find you’ve already gone into Lightroom, go to the Help menu and make sure you sign out. 7. Now enter your serial number and you should be good to go. It’s messy if you have a CC licence and need to install Lr on an extra computer. As you can run CC on two computers, you can always deactivate the CC installation on one computer and activate it on a third. But that’s tedious and so a few people buy an extra, perpetual licnce copy of Lightroom and want to use its serial number to install on the additional computer. The trouble is, the installation routine asks for your Adobe ID, and then recognises you’ve already activated your two installations. If you have both a membership and serial number for Lightroom CC and want the option to enter a serial number with installation, you will need to sign into [ie install] Lightroom with an Adobe ID that does not have a Lightroom membership associated with it. Simply create a new Adobe ID to sign in with. 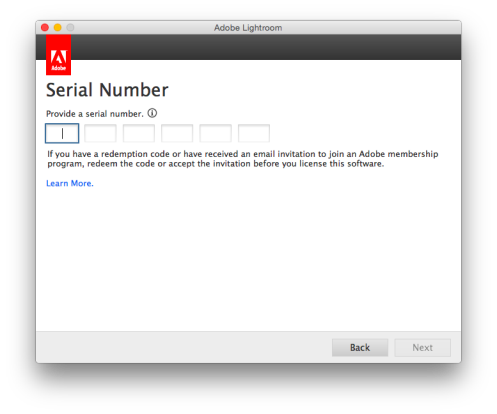 Logging into[Installing and then starting] Lightroom with an Adobe ID with no active Creative Cloud memberships will allow Lightroom to ask for a serial number. So create that account, ensure you’re signed into it on the computer which is going to have the serial number Lightroom, and then install Lr. Start it and you should be able to enter the serial number. If you’re still in trouble…. If you still need help activating your product, work with a support agent here. Via Twitter, @Adobecare is a good way to get a human to help you. Help, please! I have LR 6 perpetual license, and it has been working fine for a year. Now, the program opens, but the cursor wheel spins, and spins and spins, never allowing me into the program to work! It wont even let me close the program. My computer runs fine, all other programs are good, plenty of available memory and top of the line antivirus is working. Sadly, the instructions for the US site no longer seem to work. The options are to buy CC annually or monthly. No option to purchase the full or upgrade license. This is AWESOME! Thank you, you just saved me couple hundred bucks! 4. DO NOT CLICK ANYTHING ON ALL PRODUCTS LANDING SITE! You will see (among other things) Lightroom CC by default. DO NOT CLICK ANYTHING WITH CC IN THE TITLE. 5. there is a ‘search’ bar saying ‘search all products’. Type in ‘lightroom 6’ there. 7. click ‘buy now’. It costs $149 for full version or $79 for an upgrade. It would appear that the check out button, once you have clicked buy has been disabled or conveniently doesn’t work!! I’ve tried your method to get the standalone version of Lightroom 6 but it is not available for my country, Singapore…. Then all I can suggest is that you contact your local Adobe office. Sorry. THANK YOU. It was driving me crazy. I already have photoshop, I don’t want to repurchase in the stupid creative cloud plan. You are a lifesaver. Is there a student version at all? Or is there only the $160 version? As far as I know, there’s no longer a student version. It’s $142 at B&H or Adorama online. I’ve bought Lightroom 6 (perpetual version) and I also have CC; but I find that I can only license Lightroom 6 by entering the serial number after first signing out of CC (so my Photoshop CC doesn’t work anymore). If subsequently I sign into Photoshop CC, my Lightroom 6 becomes Lightroom CC version rather than staying as Lightroom 6. I’ve heard it’s possible if you have two Adobe accounts – one for CC and another for the perpetual. Crazy! By the way, why do you have perpetual as well as CC? Would a 3rd CC installation be better – assuming cost was roughly the same? (i) If I use the non-CC Adobe account, then I can enter the serial number into Lightroom but my PS CC no longer works. (ii) If i use the CC Adobe account, then my PS CC works but Lightroom (even though I put in a serial number before) becomes Lightroom CC! I saw on the Adobe forums someone else with a similar problem. He has an Adobe CC account and has PS/LR installed on the maximum of 2 computers. He bought a perpetual licence to have a third install of LR but when he enters his Adobe ID into LR, LR says he is up to his maximum of 2 installs and doesn’t proceed to ask for a serial number for a perpetual install as an alternative! “why do you have perpetual as well as CC?” It’s not due to cost. I’m forced into CC because that’s the only way of getting the latest version of Photoshop although I’d prefer a perpetual version. For LR, I know I already have it included as part of my monthly CC but I still want in addition a perpetual licence of LR because (i) it’s available and (ii) of a (perhaps unfounded) concern that a “rented” copy (which checks every 90 days in theory) may at a bad time go down suddenly whether due to a software glitch or something. I want the certainty of entering a serial number into LR and knowing that it should remain licensed. When I follow the steps above for buying a LR6 upgrade from LR5 on store2.adobe.com/dk (for Denmark) everything is fine till I get to the checkout page. Here I would expect to enter credit card information, but nothing happens. Instead I see a reference to a phone number which states – after a couple of specifications og what the problem is – that it cannot help me. Does Adobe really want to sell the standalone version, or are they just trying to annoy customers to buy the cloud solution ?? A very good question, Johannes. I guess I should use the American expression and “plead the fifth”…. Have you tried using another browser, just in case it’s not Adobe’s fault? I tried both Safari and Firefox – both several times, and both yesterday and today. If I update to Lightroom 6 following these guidelines, the old version(5.7) will be deleted when the new Lightroom installs ?? No, it’ll still be installed. At a slight tangent – I’ve been impressed with Capture One lately and MacPhun Intensify Pro. Intensify is a Lightroom plug-in, but C1 is fiddly to integrate with Lightroom. A big thing about C1 is that it appears to do better RAW conversions than Adobe. Unfortunately it loses some of its edge when operating on DNG files. It does have a respectable looking database. It has layers and basic masking. A big thing about Intensify Pro is that it its cheap, has an excellent interface and the cleanest approach to layers. Only One Perfect has decent masking options. Their luminosity mask is a step up. I find myself trying the different software on old favorites and close inspection usually gives the prize for surface satisfaction and tastefulness to C1. but the prize for speed and drama to Intensify Pro. These ramblings are prompted by a feeling that Adobe is becoming manipulative and i like to business with counter-parties that I like. It must be the software equivalent of the seven year itch!